As entrepreneurs, we need to take inventory of the past year before setting goals for the next year. Taking a look at what worked and what didn’t illuminates just how far we have come. We tend to focus on what we didn’t accomplish or what didn’t work, but that list pales in comparison to all the positives. There are lessons in all of our experiences. Today I share a simple exercise that takes inventory and raises your vibrational frequency so you can manifest what you want in 2019. Host ... Más informaciones Bonnie Groessl, MSN, is a best-selling author, international podcast host and business consultant. Her clients learn how to share their message with people around the world by developing a robust online presence that can include podcasting, publishing, video and blogging. Bonnie and her husband, Mike Dauplaise, own and operate a boutique publishing company and virtual marketing team, offering services that fit the needs of entrepreneurs and small businesses who want to accelerate their journey to success. CLICK HERE to get your newsletter delivered directly to you with the podcast links, a message from me and access to over 60 gifts from the previous shows. Connect with Bonnie at http://bonniegroessl.com/ Facebook page: https://www.facebook.com/CoachBonnieGroessl/ Facebook Group https://www.facebook.com/groups/EntrepreneurMastery/ Questions or comments about today’s show? 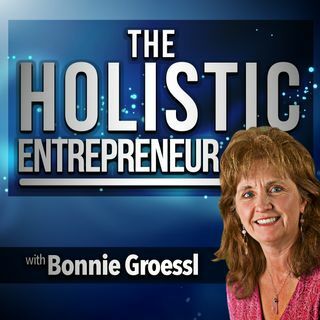 Schedule a chat with Bonnie at https://meetme.so/myclients CLICK HERE to donate to “The Holistic Entrepreneur” show.